This almost five hour hike is worth the effort. Looking to add some “Wow” into your life? Then the High Rock Loop is the ticket. A waterfall and spectacular views can be combined with rocky scrambles for a full day adventure. If there isn’t time for the whole High Rock Loop trail it’s worthwhile to shorten the hike and just do the 1.2 mile Bad Branch Falls trail to the waterfall. Strenuous at times- the first part of the trail along Bad Branch follows the stream along an easy grade. As soon as the fork to the High Rock Loop begins the elevation changes begin and and the rock scrambles that makes this trail difficult to navigate. The best times to see this trail are spring and fall when the temperatures are more moderate, in summer the heat and humidity can be intense and in winter this strenuous trail could be impassable or dangerous due to wintery conditions. Nestled in the heart of coal country on Pine Mountain is an unexpected gem, the Bad Branch Falls State Nature Preserve and the High Rock Loop Trail. Cutting through a grove of old-growth hemlocks, winding along streams, scrambling rocks to expansive views, and a with an optional side hike for waterfall chasers, this trail offers a lot of wow for a day hike. High Rock provides an unparalleled view of Whitesburg and the surrounding area. Here is a fantastic spot to look for migrating hawks swooping through the air in the fall. In addition, the nature preserve houses Kentucky’s only known nesting pair of common ravens (and numerous other species) so bring the binoculars for a chance to spot wildlife. The hiking is rugged in this part of Kentucky—a few steep climbs, narrow ledges, lots of tree root steps, and some rock scrambling—but it’s worth it when summiting this interesting trail. With arguably the best views on Pine Mountain, there are also some pretty impressive drop offs to keep an eye on. The 2,343 acre preserve contains large concentrations of about 30 species of rare and uncommon flora and fauna. A few of the rare species are enchanter's nightshade, Fraser's sedge, painted trillium, and the long tail shrew. The area was logged in the 1940s but a few old growth hemlocks were spared and thrive above the second growth trees. 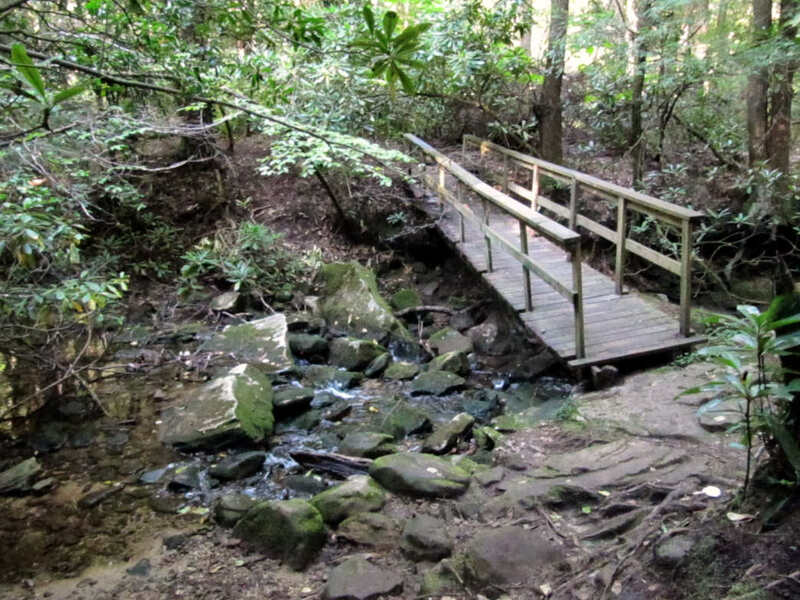 Starting off on the Bad Branch trail from the parking area, hikers are treated to the accompaniment of the music of trickling water for the first section of trail as it follows a stream through mountain laurel and hemlocks along an old logging road. Soon the cadence of the 60 foot waterfall created by the pure waters of the Bad Branch river over a sandstone cliff can be heard. Take the spur from the main trail to visit the falls. After sunning on the rocks beneath the waterfall, or perhaps even taking a quick shower in the falls, continue back up the trail to the High Rock Loop section. A rocky 2 mile steep scramble to the crest of Pine Mountain travels through a mountain pass known as the Ran Polly Gap. Reaching High Rock, a sandstone outcrop providing panoramic views of the Cumberland Plateau and Black Mountain, hikers are provided with an unparalleled vista of Whitesburg and the surrounding area. Beyond High Rock, hikers plunge back into the dense forest. Along this section, people must be careful to watch for blazes and keep a close eye on the map, as well as the rooty and rocky ground as this is the least maintained part of the trail. Then the loop connects back with the Bad Branch for an easier trip back to the car. Serious hikers who enjoy a rugged experience will have a ball navigating this jam-packed trail. A good map and decent orienting skills are essential for the more remote and least traveled parts of the trail. Due to the strenuous nature of a good portion of the trail, younger hikers aren’t a good fit for the whole loop, though families could enjoy the Bad Branch trail to the waterfall. Letcher County - From the junction of KY 15 and U.S. 119 S.E. of Whitesburg, follow U.S. 119 south 8.0 miles. Turn left at junction with KY 932, travel east for 2.0 miles to gravel parking area on left side of KY 932. It is advised to start the hike early in the day (by 10am) to have time to get down before dark. Hikers have been known to get lost on this trail.